I first moved to Ireland in 1995. At that time it was a much different place than it is today. Back then, people seemed to be more connected, better realising that we are all dependent upon each other to make it through this often tumultuous journey called life. Don’t get me wrong, that sense of community is still present. All one has to do is look at the selfless efforts of the people out feeding the homeless at night or those who volunteer to answer phones taking calls from people who are desperately trying to hold on to any reason to live. But as I sit here listening to Brendan Bjorn’s movie playing in the distance while he lay in his bed and I watch the grey clouds rolling in, it strikes me how deeply, painfully, we are struggling. And we, my little family. For the past 17 months, behind the scenes of my often all too public details of life, I have been fighting (with the help of a solicitor and barrister, to be fair) a situation that could have very well resulted in causing Brendan Bjorn’s death. That’s all I will say on the matter for now. Anyway, a few days ago, the weight of the world was lifted off my shoulders and I received word that the matter was resolved in my favour…but far more importantly, in Brendan Bjorn’s favour. And let’s not forget Declan, who upon being told the good news had tears in his eyes of sheer relief, as he carried a burdensome load of worry that no child should ever have to do! Read it one more time and let it soak in just a bit more. It’s a powerful statement, isn’t it? My shelter the past 17 months has been the grace of friends and charities who saw fit to remember that it takes the now seemingly old-fashioned sense of an intertwined community to survive, if not even to thrive. It takes compassion, reaching out, reaching down, reaching up and giving. It takes being someone else’s shelter when they no longer have the ability to provide their own. And yes, it takes love. Good old-fashioned love of fellow human beings. And today, while that tremendous weight has been so thankfully lifted, I still worry about my little family becoming homeless. The past 17 months of this struggle has found us at rock bottom – or what I hope to God is rock bottom – and that has left me shaken to my core. I don’t know how else to describe it. Honestly, I don’t think I have ever been under such soul-destroying pressure. I must now try to rise back up, dust myself off and do everything within my abilities for these two beautiful boys that I am blessed to have as my sons. It may take the community to help see us rise back up, and for that I am humbled (ok, utterly humiliated) as I follow the advice to put out a call for a helping hand. I have nothing to offer in return at the moment, nothing other than my experience, knowledge, and voice to help other families on this journey with special needs children. I have nothing to offer in return at the moment but the ability to give in kind that spirit of community which adheres to the understanding it is in the shelter of each other that the people live. My thoughts have been filled this past week with the story of little Charlie Gard and his parents, Chris and Connie. My heart has been heavy in knowing that they are, at this very moment as I type, preparing themselves to say goodbye to their little boy as he transitions to be an angel watching over them rather than one whose hand they can hold. 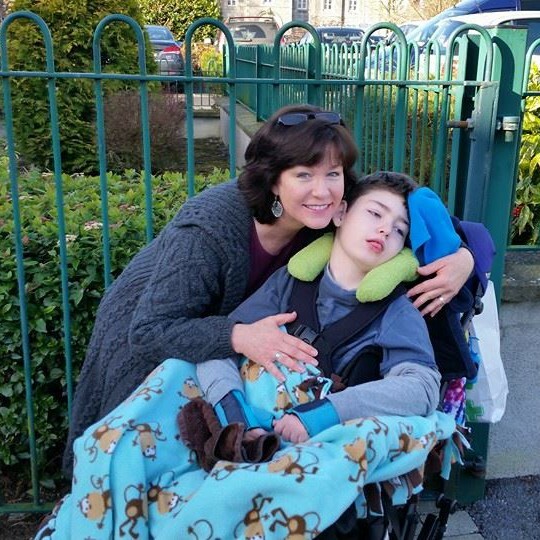 They’ve not even had one year with him, yet their journey with a child who has a life-limiting illness has undoubtedly taught them – and hopefully the greater community – about true unconditional love. I hope the moment Charlie passes will be one of peace, surrounded by love and light. I hope they are nurtured and lifted up by family, friends and their local community in the coming days, weeks and months as their journey takes a turn down a different road. I hope the weeks and months to come will find them able to increasingly embrace the beautiful lessons that Charlie was here to teach us all. I hope they will carry on his loving legacy in good works for children who also have life-limiting conditions, for there are too few voices amongst our community. I hope that life will bring to them acceptance of this journey despite the indescribable heartbreak that comes with losing a precious child. And I hope their relationship as a couple will grow stronger through this storm, and that their future will be one filled with enduring love. I have been amazingly blessed to have my son Brendan Bjorn for over 12 years now. I understand that one day, some month, some year, I will lose him. I have fought tirelessly for services and proper care for my son – and continue to this day to fight – so I have nothing but respect for Chris and Connie’s efforts as they fought with everything they had in them to see the best for Charlie. It is not the natural order of things, a parent having to bury their child. I even believe it to be the most cruel of life’s possible journeys because surely there can be nothing as painful. Hold on to and cherish the beautiful moments; to the endless, unconditional love as it will last a lifetime; to that gift which Charlie brought into your lives. For these are the parts of this heartbreaking journey that enable us parents able to continue, and in time, even thrive as we share the story of our special angel. If I could give you one gift, Chris and Connie, that is what it would be. Last Sunday, an article was published highlighting Brendan Bjorn’s need for an urgent spinal fusion. For him, it is a matter of life and death. With severe cerebral palsy that has left him with no muscle tone in his trunk, his spine is literally crushing down upon his internal organs. His lungs don’t function as they should and are more prone to infection, especially considering he already has lung disease. His stomach cannot process feeds any more except at an incredibly slow pump rate into his PEG line. His intestines and bladder, all feeling the pressure of a body toppling down upon itself. His bottom ribs are hitting the top of his pelvic bone. His femurs are not sitting in the hip sockets as they should, in fact, the left side is dislocating. And as his body twists and compresses, he loses weight with the inability to take in the nutrition he needs and pressure sores have been a result of the weight loss and changing body alignment. Like I said, it is a matter of life and death. The operation must happen urgently. As of this writing, he still isn’t on the scoliosis surgery wait list. The consultant needs to sign a form is what I am told. Yes, he will be backdated to the time of the appointment with the consultant (June 2nd), but until he is on the waitlist, I don’t know how long of a wait we are looking at…and how much of a fight I must prepare for in order to make it happen as soon as possible. My two sons are my life. Even though most mornings I wake up and don’t want to get out of bed (that is the harsh truth of life at the moment), I get up because I must. I get up because these boys need me to fight for them. I get up because these boys are both struggling in their own unique ways, and by God, I will do what I must to assure their individual lives are the best they can be. I don’t mean materially. I’m talking about quality of life – health (both physical and mental); security in having a safe, suitable home long term; having the support of friends, community, and schools to encourage and nurture their individual growth. I have recently decided to return to Kilkenny. I’ve missed it. Declan has missed it. And Brendan has a fabulous special school that is excited to have him return. As such, our fruitless search for a rental home in this impossible private housing market has now shifted from North Kildare to Kilkenny. After 15 months in Kildare, we are happily going back to Kilkenny. Today I will be doing a radio interview with the local Carlow-Kilkenny radio station regarding our search for a suitable rental home. I hope it will result in our finding a secure, disability suitable, long term home. Brendan Bjorn so desperately needs it. Declan so desperately needs it, too, as he has a weight on his shoulders that most adults cannot even comprehend. I need it, too, because the thought of pending homelessness fills my mind constantly, and that affects my ability to fight to put out all the other fires in front of me on this ever challenging journey. Here’s hoping this week brings good news on housing, on the surgery wait list, and on our overall security. I have to believe that good will always triumph over all that is bad. Last night, just before midnight, Brendan Bjorn’s seizure alarm went off. I ran to his room and found him losing colour and in a full blown tonic clonic seizure. I can never be sure how long he may have been seizing before the alarm sounds, because sometimes it doesn’t pick up the repetitive, convulsing movements. The fact that he was beginning to turn blue told me it had been too long. I put on the O2 sat monitor…he was at 70. I grabbed the oxygen tank, turned it on and placed the nasal cannula around his head. I put my right arm around Declan while holding Brendan in my left arm, and I told him not to worry, that I was right here with him. It didn’t help. He ran out of the room saying he would call an ambulance. He was frantic. This has never happened before…in all the years of him witnessing his brother have seizures, has seen paramedics rush into the house to help him…but last night, something was different. I called Declan back into the room and explained I needed to give Brendan his rescue medication to stop the seizure. He stayed by my side all the while begging his big brother to hold on and not leave us. The rescue medication worked, or maybe it was just the timing with the seizure ending, but he stayed with us…thankfully…thankfully. Once I got Brendan Bjorn settled and asleep after the postictal phase of the seizure episode, I had a gentle talk with Declan. I’ve never seen him react this way and, honestly, I found it equally as upsetting as the seizure, if not more so. One thing that was clearly evident is that Declan has a bond with his brother like no other I’ve seen. Despite being nearly 4 years younger, he is his brother’s keeper. This morning, both boys are fine, although Brendan Bjorn is understandably a bit more tired than usual. Declan is already on his PS4, sitting near his brother, and his world is right again. I haven’t been in the headspace to write this past week. That is never a good sign. In fact, it’s a sign that I am overwhelmed. Make that more overwhelmed than usual. It’s a sign that I am being weighed down by too many things, trying to dodge bullets being fired from all different directions, and I’m being grazed by a few of those bullets, if not hit altogether. The result may be random ramblings linked only by the fact that this is our life. Brendan Bjorn was admitted into hospital on three different occasions this past month. After tests and xrays and blood work and exams, it all boils down to the fact that the neurology of his digestive system isn’t doing what it should do. There is no miracle cure. His peg feeds via pump are now spread out over a 20 hour period in the 24 hour day. The other 4 hours is when he gets the extra fluids his body needs in the form of Dioralyte. In those all important 24 hours, I need to now add 3 equally spaced out doses of Erythromycin which will hopefully help the motility of his gut. And, of course, there are his other twice daily medications for seizures and liver function. I’m still trying to sort out a smooth, well-timed schedule. It hasn’t yet happened. All the while, I have been doing all I can to locate a new rental house for us to call home. It’s not so easy from a hospital room, let me just add. We are now out of the hospital, but the search remains incredibly hard and seems impossible. The media has even picked up our story with an article having been published yesterday. I tweet, I email, I view homes pushing Brendan along in his wheelchair amongst the numerous other potential tenants. …and I abhor having to do so. But it is for them…those two beautiful boys that I am blessed to call my sons. There are so many pans in the fire I’m sure something will get burnt. I’d say it will be my mind, and as a parent on this journey with a child who has a life-limiting illness, I am willing to do that if it’s what it will take to make life what he – what they both – deserve. Brendan Bjorn also needs an urgent spinal fusion. I hear 15 months is the minimum wait on the dreaded scoliosis waitlist. This will not do. He doesn’t merely have scoliosis (a condition which as we all know is terrible on it’s own accord), but he also has severe cerebral palsy which has made his trunk completely devoid of any muscle tone. He is literally crushing down in upon himself with gravity overpowering his fragile, helpless body. His lower ribs are hitting the top of his pelvic bone. His gut is being compacted and it is severely impacting its ability to function. With each day he waits, my pain, my anger, my feeling of desperation, continues to grow. My youngest son doesn’t understand, at just 9 years old, why we can’t find a long term house to make our home. He, too, is experiencing emotional fallout from the battles we are facing. What he is going through now will form him as an adult, and that fact weighs heavily on my mind. I cannot financially afford to give him the secure family home that every child deserves to grow up in filled with contentment and sense of grounding. Every single day, I wrestle with the acknowledgment of my failure to be able to provide this for him, and for Brendan Bjorn, and it’s bringing me to my knees.